Posting and sharing your own content on a social collaboration site is great, but effective use of any social network is not all about self-promotion. You must listen to what others say and think about what you can add to the conversation. Each post in the activity stream of a social collaboration application is accompanied by a Like button (or similar opportunity to express your approval) and a space where you can type a reply. This part of the interface looks a little bit different in each application, and some applications also provide other tools, such as a Share button. Like: This is a quick sign of approval, the equivalent of a nod and smile or even a “Good job!” “Liking” a post on a collaboration network means pretty much what it does on Facebook and other public social networks that employ a similar mechanism. Sometimes the terminology is a little different: maybe a thumbs-up, or a system for awarding points. The idea is the same, though — to give a quick vote in favor of a piece of content. This one-click feedback mechanism doesn’t even require writing a message. If you’re in a hurry, or if you have little to say beyond I like this, just clicking the button is enough. Such feedback may be quick, but it’s still helpful, letting the author know that someone else found the content useful. As a post accumulates likes and comments, it becomes more visible to more people on the social collaboration network, perhaps showing up on a list of trending topics or most active conversations, which, in turn, attracts more likes and comments. Reply: Some interfaces include your avatar and space to type your reply below each post. Others require you to click Reply to access the field in which you can type your reply. Either way, responding to a post in the activity stream is fairly straightforward; you simply type your message and press Enter or click the button that sends the message. Reply with more info: Sometimes you’d like to direct a colleague’s attention to another resource, or bring another colleague into a discussion. You can do that by replying to a post and including a link, uploaded document, or tag. Share: Give the post a broader audience by sending it to a colleague or a collaboration group, along with your note about why it’s significant. 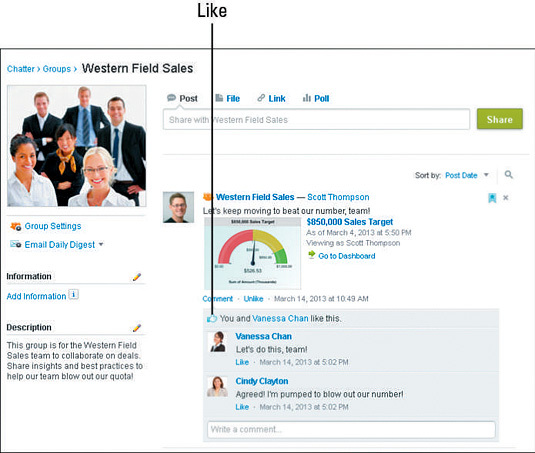 Social collaboration platforms keep track of the Likes on each post, as shown in the following figure. You can see that Salesforce.com Chatter users particularly like to Like progress toward sales goals. Sometimes you may want to do both: Click Like and also write a comment, saying more about why you think the post is interesting or useful. Answering the right question can make you a hero, not only to the person who posed it but to others following the discussion. Or, maybe you don’t know the answer to the question being posted, but you know who would. Write back, tagging the expert who ought to be part of the conversation in your message. If you think what others are saying is wrong, try to set them straight — politely. When a conversation bubbles up around a topic that you had seen discussed previously, provide a link to the old discussion so it can inform or maybe eliminate the need for the new one. 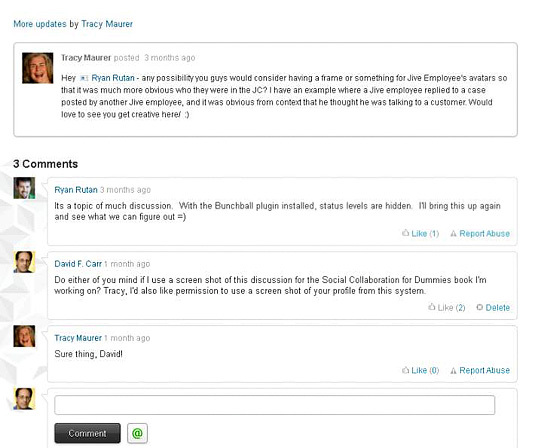 Jive users, community managers, and administrators answer each other’s questions about best practices for social collaboration on the Jive Community website (shown in the following figure), which is itself a social collaboration community.